A SEARCH on an Exchange calendar folder with a constraint of a begin and an end date is called an expansion query. This means, that all recurring appointments are expanded, and each instance is returned in the query. (See Searching Calendar Folders with WebDAV on MSDN for more information. The article specifically targets the WebDAV protocol, but the issue explained here applies to the ExOleDB provider as well). An example of such a query is displayed below. Error while processing WHERE clause in the SQL statement. To work around this problem, do your search in multiple steps, with a time span of two years or less. This is a known limitation in the Exchange Server: Expansion queries are limited to a time span of two leap years. The WebDAV protocol can be used to send emails. This can be done by creating the email in a mailbox folder (i.e. the Drafts folder) and moving this item to the ##DavMailSubmissionURI## folder. This is described in this MSDN article: Sending a Message (WebDAV). the url for the PUT command would be something like http://myserver/exchange/jdoe/drafts/new_mail.eml/attachment.zip. If you created the mail item via the PUT method, instead of a PROPPATCH, you might get a 409 - conflict error when adding attachments to the item. A workaround seems to be to issue a PROPPATCH on the mail item itself. The PROPPATCH does not necessarily have to change the item. It's more like a touch command. After this PROPPATCH command, the PUT command for the attachment will be successful. If you must process items in the store synchronously, you must use conventional eventsinks (OnSyncSave and OnSyncDelete). If your task is performance critical, you should also use the conventional eventsinks. If you are not allowed to run any code on the Exchange server, the only option you have is the WebDAV event system. You are only notified that a change (new item, update or delete) has occured. For example, if you monitor a folder for changes, you will get a notification when a change has occured. You won't, however, get the URL of the changed item. Traditionally, this means that you must du a SEARCH and search for all items with the DAV:getlastmodified property set to a greater value than your last search. With Exchange 2003, new promising system has been introduced, namely WebDAV replication. The notification packets are sent via UDP. This means that there are difficulties with firewalls and such things. In this case, you can still use the system, but you must use the POLL method frequently to get information on changed items. The Exchange Server returns a subscription ID to the client that uniquely identifies the subscription. An item within the monitored folder is modified. The Exchange server sends an UDP packet to the client which contains a list of all triggered subscription IDs. Until the packet is acknowledged, Exchange will continue sending packets with a decreasing frequency. After the client has processed the request, it sends a POLL message with the subscription IDs of the events he has handled. When the client does not need the subscription any longer, it issues an UNSUBSCRIBE call on the folder specifying the subscription IDs he want to cancel. The example code attached to this article is a console application that monitors a folder or element on an Exchange server for changes. Full source code is included. Note that this example uses the WebDAVLayer component. As this blog points out, it is sometimes necessary to control the generation of delivery status notifications, for example if the Exchange Server is responsible for multiple domains. In this case, Exchange uses the default SMTP domain as the sender for DSNs. The blog entry briefly describes the necessary steps but it turns out that the entire process of registering the sink is poorly documented. Additionally diffculties arose because I wanted to implement the sink with managed code. Also Microsoft offers an example on how to implement managed transport event sinks and also includes the necessary type libraries, this library lacks the necesssary interface definitions required for the OnSyncGenerateDSN event sink. This implementation changes the domain for the DSN to the domain of the first recipient of the original mal. The first step was to generate a type library which contains the interface definitions for the event sink. To do this, I modified the smtpevent.idl file, which is included in the Platform SDK. The modified version is attached to this article. I compiled the modified smtpevent.idl with the MIDL compiler and created an interop assembly with the Type library import utility (tlbimp.exe). Unfortunately, some of the methods are incorrectly marshalled, and thus, can't be used. So, the next step is to decompile the generated assembly with ildasm.exe, correct the definition of the methods and recompile the source with the ilasm.exe compiler. The modified interop dll is also attached to this article. This implementation sets the domain for the DSN to the domain of the first recipient of the original message. After the code has been compiled to an assembly it must be registered on the Exchange server with the regasm.exe utility. The final step is the registration of the event sink within the store. Again, Microsoft offers a script which handles registration, unregistration and enumeration of SMTP event sinks. And again, this script lacks the functionality to register DSN related event sinks. A modified version of this script is also attached to this article. This installs the event sink on the first SMTP virtual server. If you want to modify the interop DLLs or the implementation of the event sink, you must sign them with a strong name. Use the sn.exe utility to create one. The attached binary is signed with a key that is, for obvious reasons, not included in the attached files. The example implementation does not write any log files. Trace output is, however, written to the Windows debug interface. You can use DebugView from Sysinternals to view this trace output. After you view an ASP.NET webpage which displays performance counter data via the PerformanceCounter class, scripts no longer function. This includes scripts launched from a command line as well as client-side scripts in any browser window that is opened after you viewed the original page. Scripts are working again after you have stopped the Word Wide Publishing service. A deadlock occurs because of a bug in one of the WMI providers. An event tracing is done which calls the RegisterTraceGuids API which in turn calls into one of the WMI Service hosted within the Services.exe. A hotfix is available from Microsoft, at least in english and german. The Exchange Address Lists are not stored somewhere on the Exchange Store, neither are they directly stored within Active Directory. The only thing that is stored in the Active Directory database is a LDAP search filter that matches the participants of the address list. 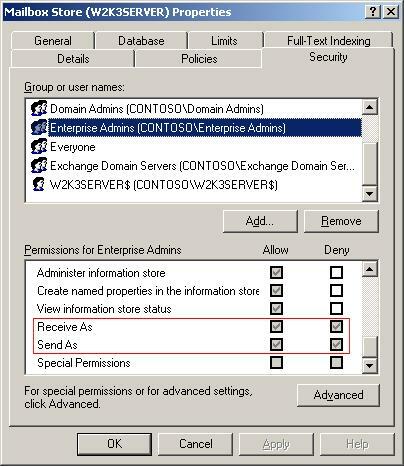 To get a glimpse on these filters you can use ADSI Edit, a very handy tool to examine the Active Directory database. BUT: As with regedit, the improper use of this tool may affect the stability of your Active Directory. You have been warned! The tool can be found on the Windows CDROM under the Support Tools. CN=All Global Address Lists,CN=Address Lists Container,CN=Contoso Ltd,CN=Microsoft Exchange,CN=Services,CN=Configuration,DC=contoso,DC=local you will find all global address lists. In most cases, however, there will only be one. The entry CN=Default Global Address Lists has a property called purportedSearch which contains the LDAP filter for this address list. This is the default LDAP filter for the Global Address List used by the Recipient Update Service (RUS). Under the node CN=All Address Lists you will find the other address lists. As with the Global Address List, every list has its own node with the property purportedSearch set to the corresponding LDAP filter. Depending on your programming language you can use different tools to do a LDAP search. If you are using Visual Basic or VBScript you’ll use the IADS Interfaces via the GetObject() command. In any .NET language you can use the System.DirectoryServices.DirectorySearcher class. Here is an example using VBScript. Note that this example only searches the default domain of an Active Directory. 19 ' Iterate through global address lists. In this example, only the last one is used. 33 oConnect.Open "Active Directory Provider"
37 oCommand.CommandText = "SELECT samAccountName, givenName, sn FROM '" & strSearchRoot & "' WHERE msExchHideFromAddressLists <> true AND showInAddressBook = '" & oGal.Get("distinguishedName") & "' ORDER BY sAMAccountName ASC"
43 wscript.echo rs.Fields("samAccountName") & " (" & rs.Fields("givenName") & " " & rs.Fields("sn") & ")"
Many thanks to Joe Richards for the hint on the showInAddressBook property. 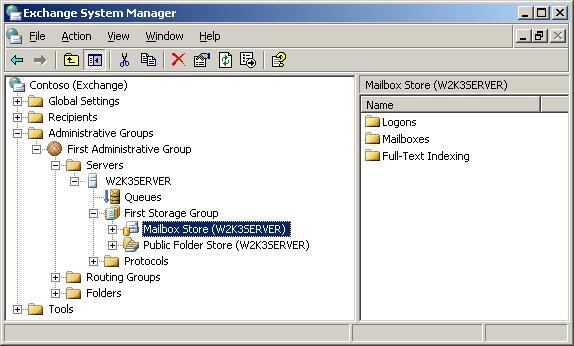 Outlook Web Access can be configured to some extent by the means of a settings page. This page is opened when you click Options in the main menu. However, Microsoft lacks documentation about which properties within the store reflect these settings. All the properties below are stored on the root folder of a mailbox. All the affected properties are within the http://schemas.microsoft.com/exchange/ namespace. 29: http://schemas.microsoft.com/exchange/workdayendtime; Values have the same meaning as in field 30. 31: http://schemas.microsoft.com/exchange/enablereminders; To enable, set bit 2 to 1. To disable, clear the bit. 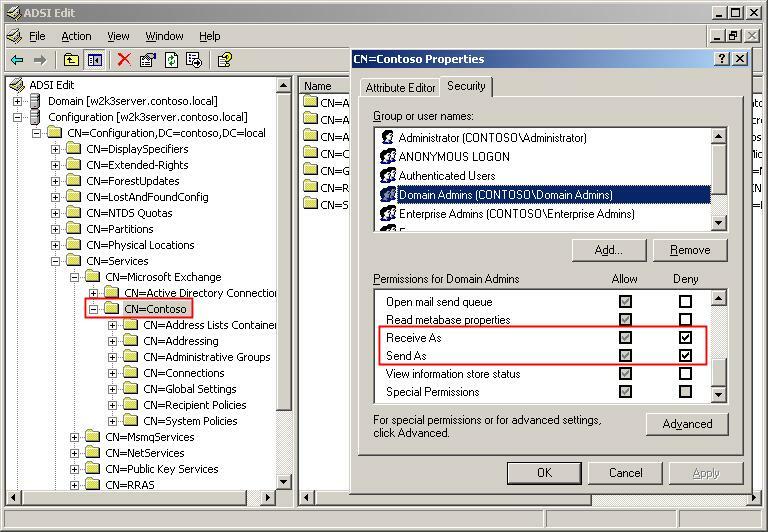 32: http://schemas.microsoft.com/exchange/enablereminders; To enable, set bit 3 to 1. To disable, clear the bit. 33: http://schemas.microsoft.com/exchange/enablereminders; To enable, set bit 0 to 1. To disable, clear the bit. 34: http://schemas.microsoft.com/exchange/reminderinterval; Interval in seconds. "Cape Verde Standard Time": (GMT-01:00) Cape Verde Is. "Fiji Standard Time": (GMT+12:00) Fiji, Kamchatka, Marshall Is. Outlook and Exchange know two ways how to delete a file: A soft-delete, which is performed when you simply press delete on an item. The affected item is then moved to the recycle-bin. The other method is called hard-deletion. These items are kept in the store for a configurable duration, typically 30 days. The size of all messages in a folder is stored on each folder object. This information can be extracted from several fields, for example the http://schemas.microsoft.com/exchange/foldersize property. But this property seems to be mapped to the MAPI property PR_MESSAGE_SIZE. The drawback with this property is, that it is limited to 32 bit, so it works only for folders containing not more than 4 GB. 7 strrequest = "<?xml version=""1.0"" ?><D:propfind xmlns:D=""DAV:"" xmlns:E=""http://schemas.microsoft.com/mapi/proptag/""><D:prop><E:x0e080014 /></D:prop></D:propfind>"
12 wscript.echo "Connecting to " & wscript.Arguments(0) & "..."
22 wscript.echo "Size of folder: " & xmldoc.selectSingleNode("//ex:x0e080014").text & " Bytes"
Where myserver is the exchange server that contains the folder you want to check and myfolder ist the name of the folder. Where alias is the alias of the user's mailbox to check.